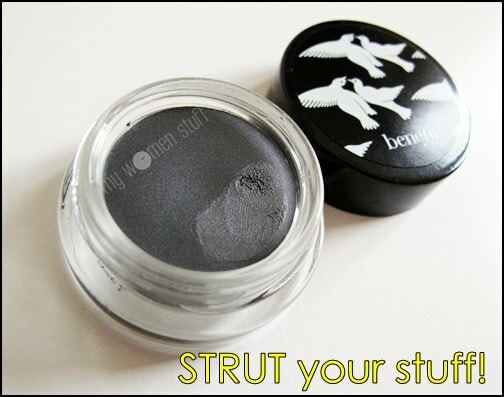 I picked up the Benefit Creaseless Cream Shadow in Strut recently because I wanted a dark coloured cream shadow. I wanted to use it as a base for my eyeshadow since I do smokey looks a lot – in the day and for the evening. Using a dark base is the quickest way to start. But I digress. Benefit Creaseless Cream Shadow in Strut seemed to fit the bill. Described as a charcoal black, the colour is in fact a dark grey and applies with a dark blue-grey tint. I thought it was alright. not quite what I was looking for. When applied, its not too dark. 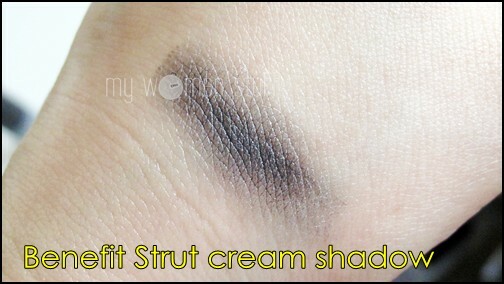 You can see a swatch of Strut below. It can get darker if you layer it. Or if you just pat it on instead of swiping it on your skin. Have you tried the Benefit Creaseless Cream Shadows and do you have any thoughts on them? I’m liking the dark shades but I’m not sure if I’ll like the light ones. Which ones do you like? NEXT POST: Is a Toner meant to be wiped off or patted on? Hmmm, I use my Maybelline Lasting Drama gel liner as a base, hehehehe. Dual use, yay! Can the cream shadows be used as eyeliners as well? It looks pretty, though! Hi PB, I ve been so busy these many weeks and seems like I miss lots of your reviews! I had 2 of these bought some time ago online frm Benefit site at low price too, in Towne Car (black) and Carte Blanche, sort of bronze neutral colour. Both colours are d/c ady. I had oily lids and so far they works well for me. They turn out to be great eye liner (the black one) or shadow base (as for neutral colour). Hi Pearl glad to have you back! 🙂 I did find that my skinny jeans is a little harder compared to Strut which is creamier but I prefer to use them as shadow rather than liner. Thanks for sharing! I keep hearing so many good things about these shadows but I haven’t got round to trying them yet. The colors seem to be all so neutral and they don’t appeal to me. 🙁 I wish they came in more colorful shades. Yup it’d be nice to see some brighter colors. Maybe Benefit will have something in store for the future? when i saw the promotion i was OMGGGG i want them all!!! but when i looked into my stash and saw everything are not very well used as i thought, i had to shut my eyes *and wallet* away from the site!!! helppp!!! but yeah, i love skinny jeans, n another colour that i have, birthday suit. the texture n smell reminds me of cream topping on cakes… yummo! I’ve been wanting to try the Benefit creaseless cream shadow for the longest time but I’ve always told myself…”for what?” lol don’t wear a lot of eye makeup lately! Maybe next time…next time..